Head west on Amity Street. You will pass Bank of America and Amherst Coffee on your left. The Jones library will be on your right. Exactly one block down, Chabad Nation is at 194 Amity Street on the corner of Lincoln and Amity. We're the house with the very large hedges. After the exit ramp at exit 19, bear right on to Route 9. Stay on Route 9 for 5.8 miles. Turn left on to Lincoln Avenue. We are the last house on the block on the right, 194 Amity Street on the corner of Lincoln and Amity. Lost? No problem. 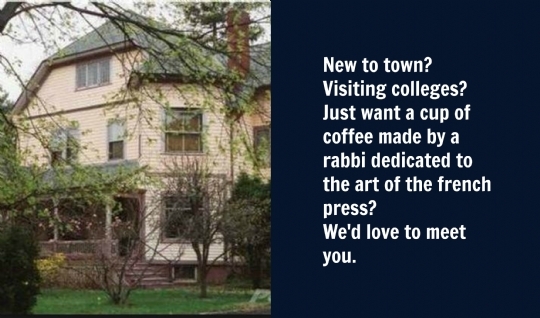 Hit the rabbi up on his cell phone: 347 463 5075.